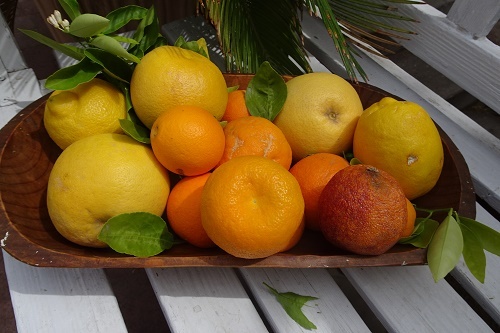 Mix citrus for a delicious marmalade with my favorite recipe. 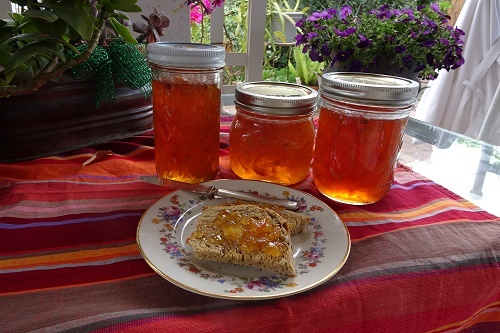 It’s Carolyn Niethammer here today to share my favorite recipe for citrus marmalade. It comes from an early version of The Joy of Cooking that I received as a gift in 1965. The most recent Joy of Cooking doesn’t even have an entry for jams though I hear there is a resurgence of interest in making them. I love citrus marmalade, but don’t like the overly sweet grocery-story version. I like a little bitterness, more like the English version rather than the American style. I’ve used this recipe for at least 30 years, varying the proportion of fruit according to what I have. Some of the oranges come from a Sweet Orange tree in my front yard that my husband as a small child planted with his dad, Dr. Leland Burkhart, a half time extension agent, half time college ag professor. Dr. Burkhart used to travel all over the state consulting with citrus growers. Since my own grapefruit tree died, I have to snitch a few of those from my neighbors. I also gather a few sour oranges from street trees in the neighborhood because I like the tang it gives my marmalade. If you don’t have access to free fruit, the farmer’s markets are full of all varieties right now. 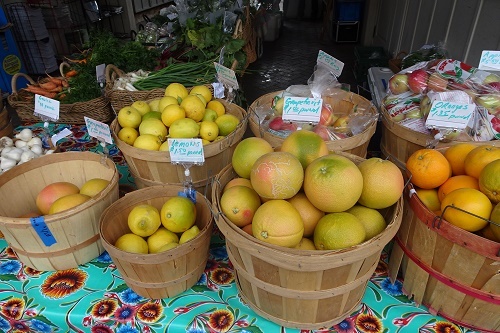 Farmers’ markets in the Southwest have abundant citrus for sale now. Although I have been using this recipe successfully for years, a couple of years ago I decided to get fancy and carefully cut away all the white pith on the inside of the fruit rinds. Then the mixture simply would not jell no matter how long I cooked it. So….I learned this is where the pectin is, what makes the marmalade thicken up. Leave the white stuff on; it disappears during the soaking and cooking. Use whatever fruit you have; don’t worry about the proportions. You could use all lemons. Last year I foraged an abundance of kumquats and used those. 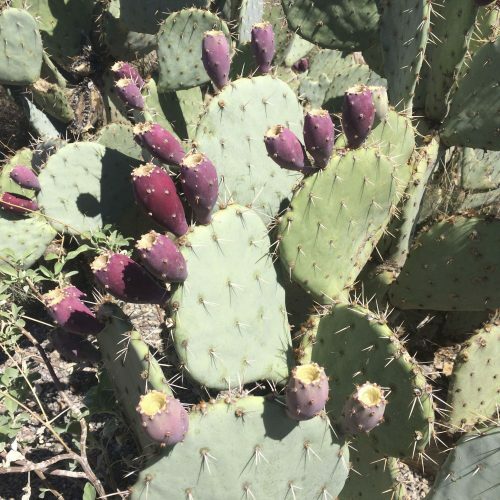 You might decide to make your version of spring marmalade special by adding some thinly slice barrel cactus fruit, or a little prickly pear juice if you have some, or even some berries. This is a very adaptable recipe. I always try to stress experimentation. Here’s a place to construct your own signature jam to your special taste preference. 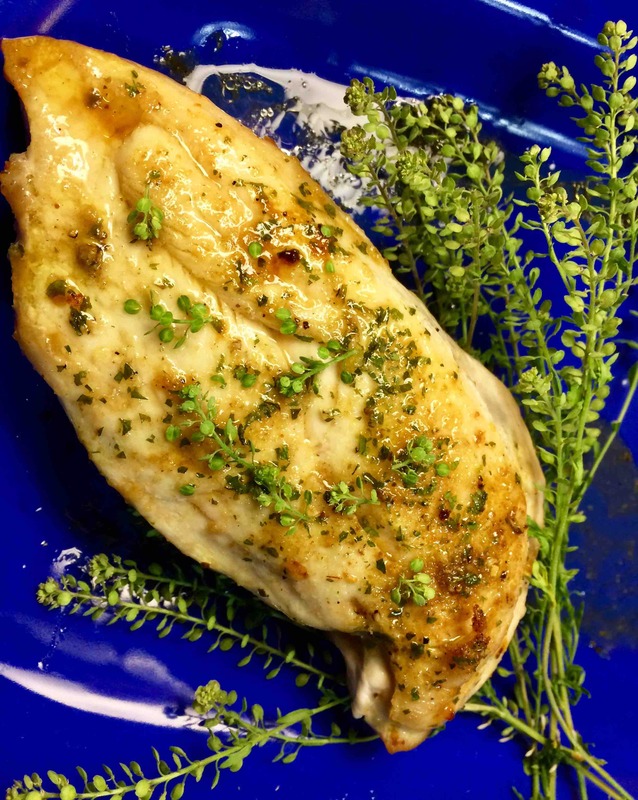 The recipe is very easy, but you have to start the process a few days before you plan to do the cooking. The fruit soaks and softens in a corner of your kitchen. During the days when the fruit is soaking, gather up your jars. If you have those with the sealing lids, fine. If not use any jars. Put them in your biggest pot, cover with water, and boil for a few minutes to sterilize. If you don’t have the lids with the rings that seal, be sure to refrigerate the jam until use. If you give it away, caution the receiver not to stick it on a shelf and forget it. I use whatever jars I have for the marmalade. Scrub the fruit, cut each in quarters, and remove the seeds. Slice very thinly. Measure the amount of fruit and juice and add 3 times the amount of water. Set aside and let the fruit soak for 12 hours. Simmer for about 20 minutes. Let stand again for 12 hours. For every cup of fruit and juice, add ¾ cup sugar. Divide into two pots if you have them or cook one half at a time. Cook these ingredients until they reach 220-222 degrees F. on a food thermometer . It will seem like it takes a long time at first and then at the end it moves rapidly. 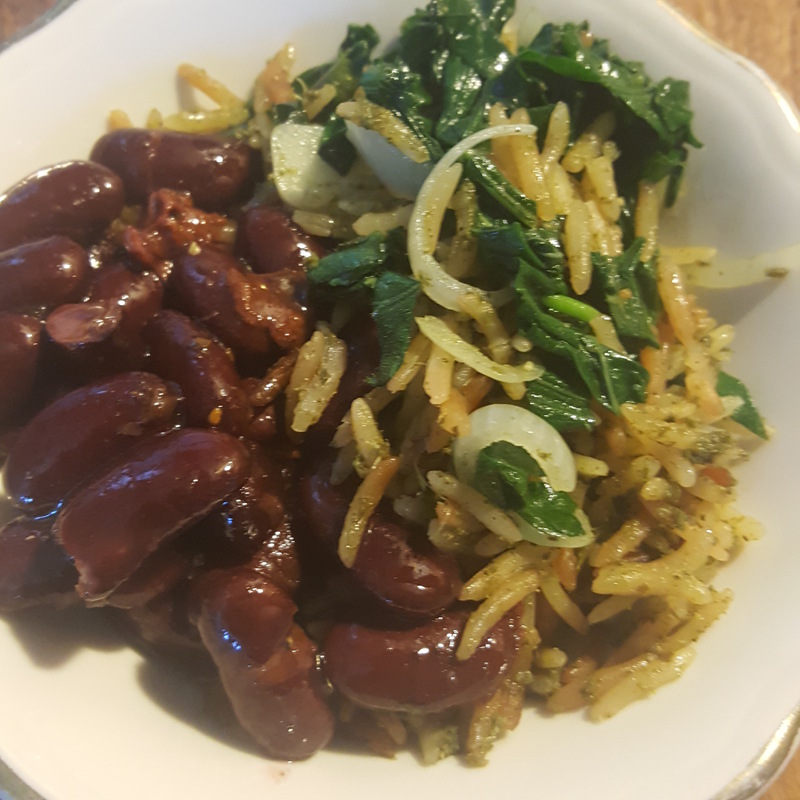 If you don’t have a food thermometer, once you think it’s looking a little thicker, turn off the heat, put a little of the jelly on a china plate and put it in the freezer for a minute. If it firms up, it is ready. 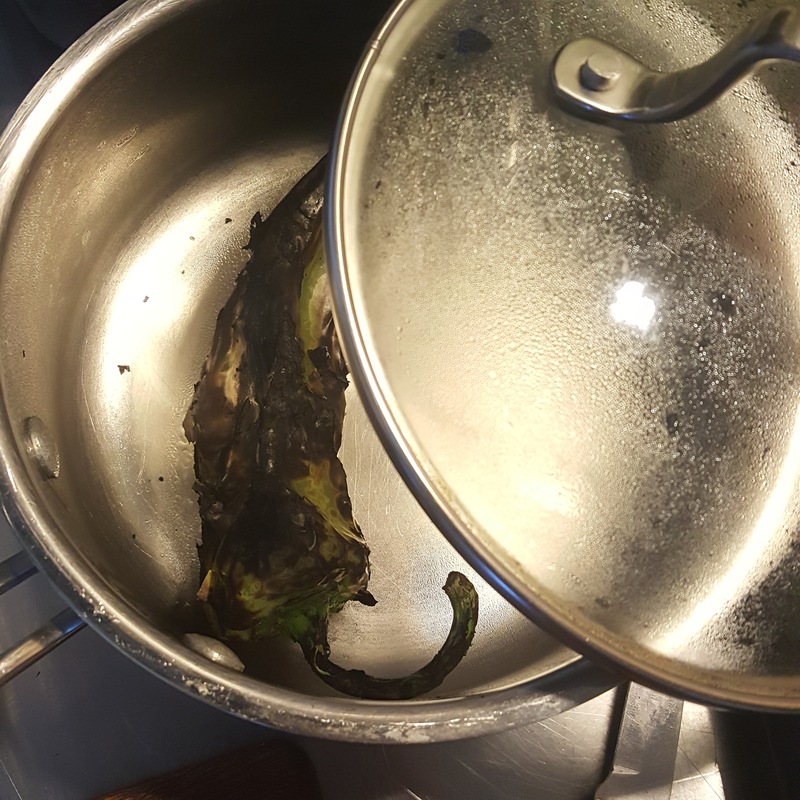 If it is still liquid, cook for a little while longer. It usually firms up a bit more once it cools in the jars. Ready for another challenge? 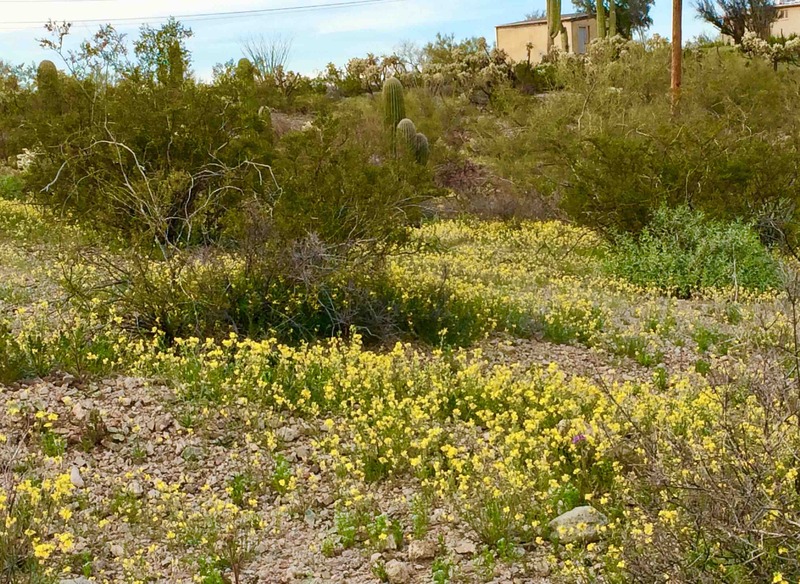 It was a rainy winter this year in the Southwest which means lots of edible wild desert plants. You can find recipes for 23 of the easiest to gather and the tastiest in my book Cooking the Wild Southwest available from Native Seeds/SEARCH and from on-line stores. How glorious! We haven’t had a spring like this in the Sonoran Desert for so long! 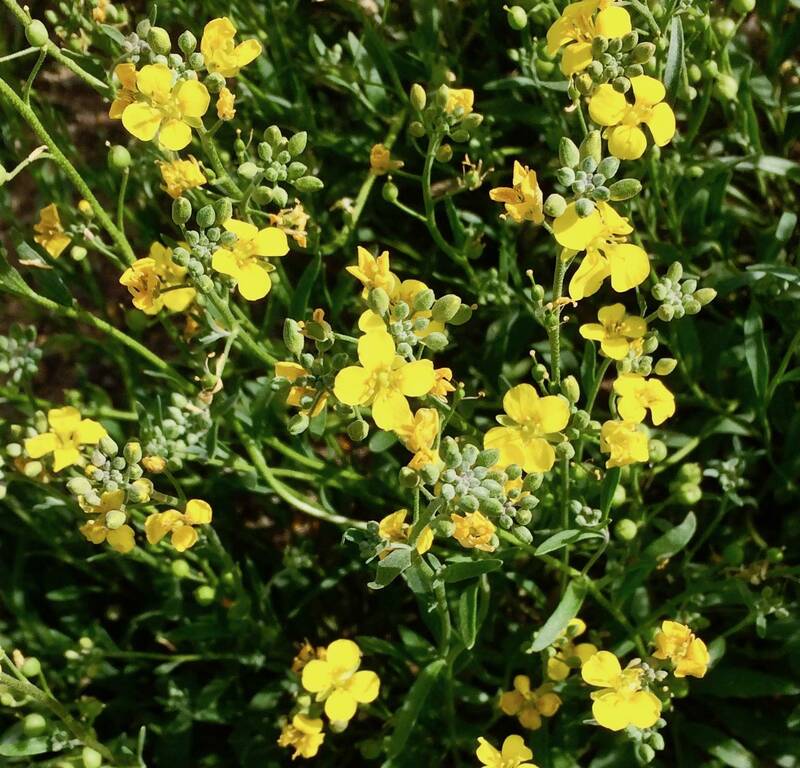 With continuing rains, there’s such plenty around us that there is more than enough for all the pollinators, herbivores, insectivores, granivores, and omnivores that may wish to indulge in the wild-mustard smorgasbord–including two-leggeds. We are drinking in–yea, indulging in–their beauty. But we also can benefit from their phytonutrients and enjoy their spicy flavors. 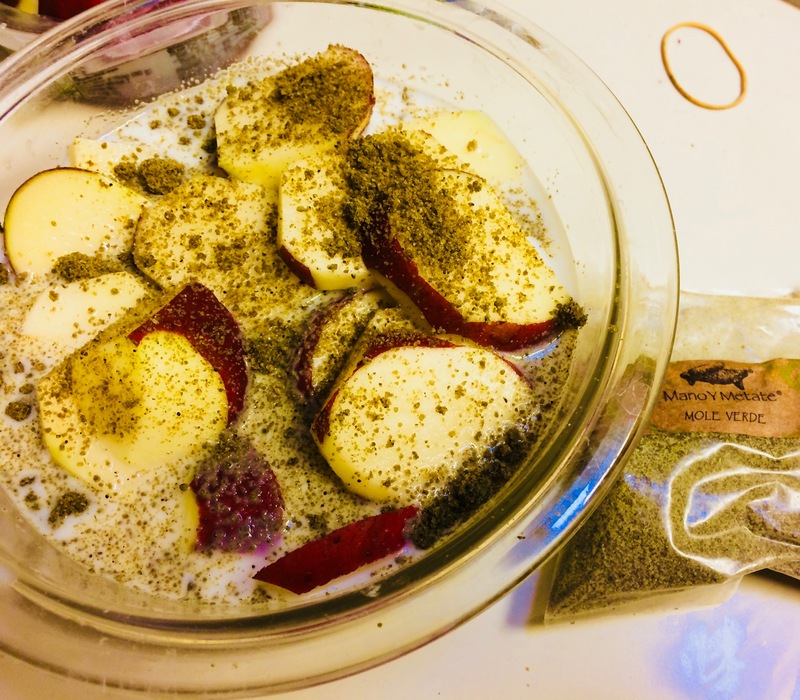 Tia Marta here to share some fun ideas for including the “weeds” from the back-forty into your cuisine and your nutrition. [As you know, I don’t really believe in weeds. They all have purpose]. 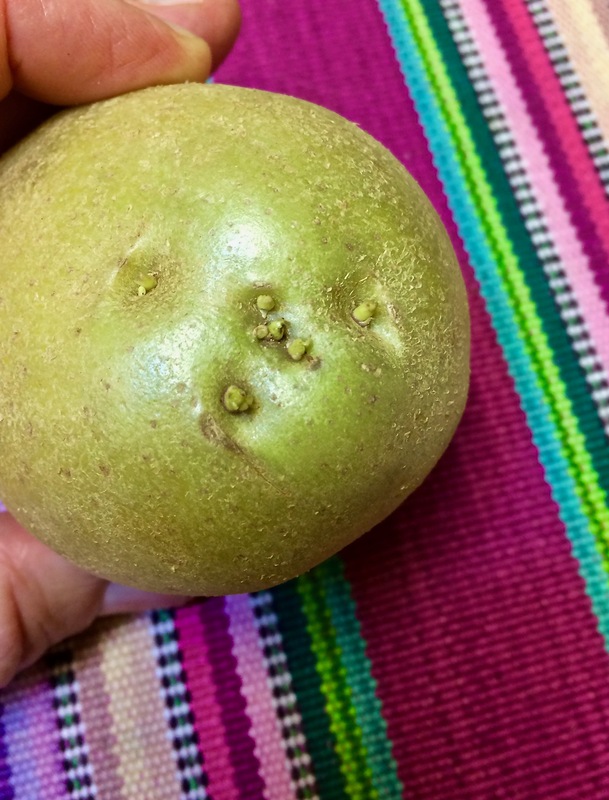 The name bladder pod refers to the spherical little fruit (seedpod) that looks like a tiny balloon with a divider down the middle, which forms after the 4-petaled flower is pollinated. 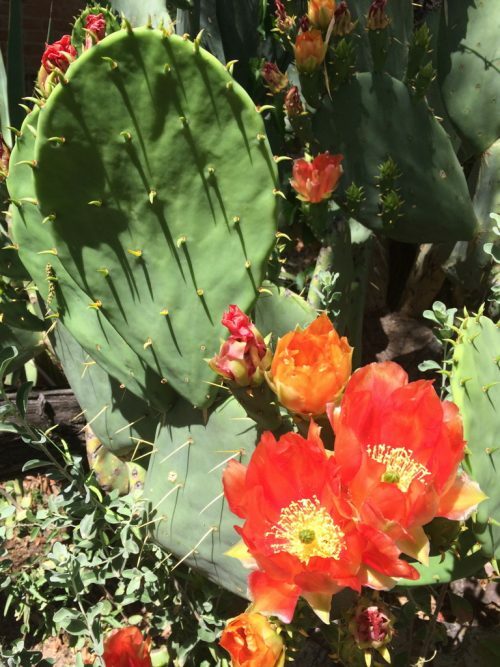 Tia Marta encourages you to go out and enjoy this amazing desert floral display. 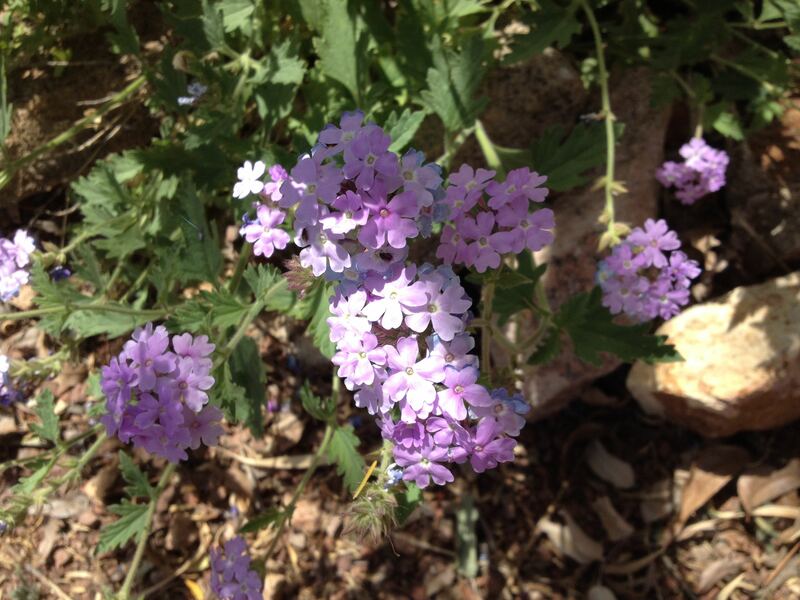 You can visit special places like the Arizona-Sonora Desert Museum or Tohono Chul Park to learn names of the flowers. 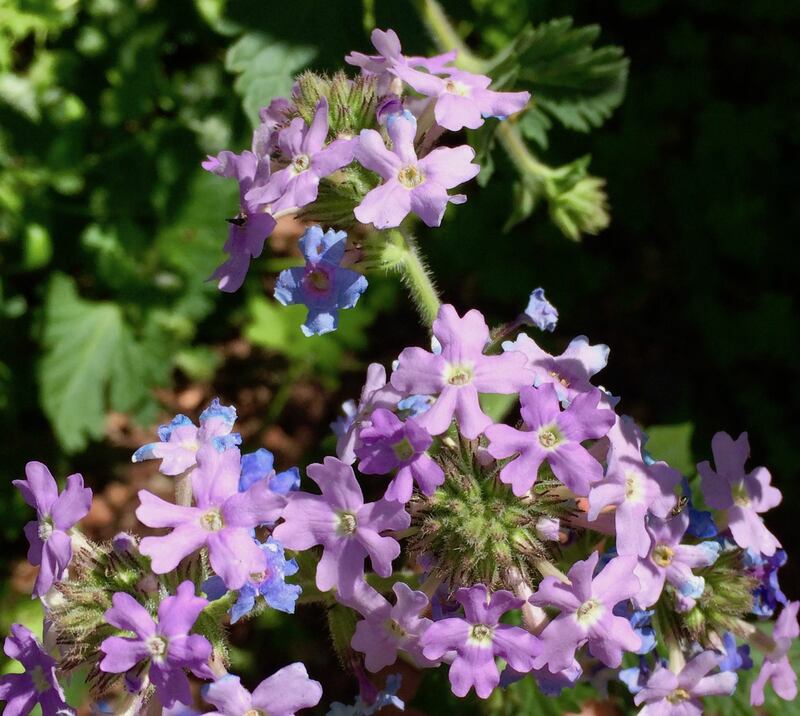 In natural places where you find meadows of mustards or verbena, know that they can provide you not only visual joy but also vitamins and minerals that only fresh greens can give. Happy flower hunting! It’s happening in favorite grocery stores and pantries around Baja Arizona. Potatoes are awakening! Some are even turning green with chlorophyll showing in their skins. They know. 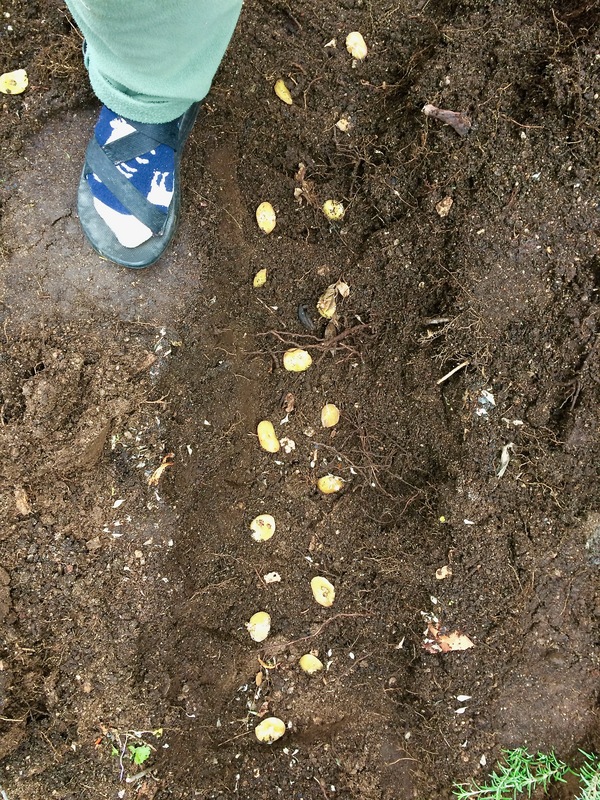 Time in the low desert to PLANT POTATOES–soon! !–while the weather is chilly and while we are enjoying fantastic soil moisture. 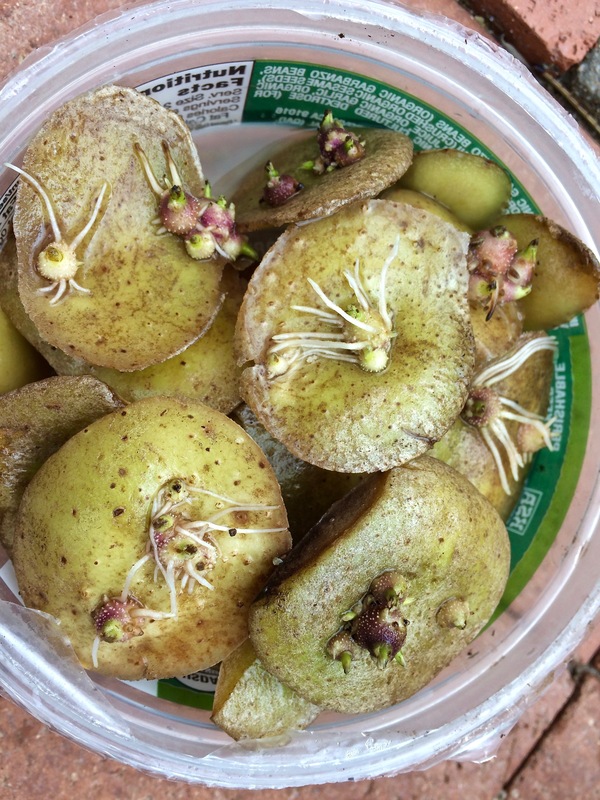 Yukon Gold potato beginning to sprout, skin turning green… This potato wants to be planted! But wait–no waste here. We must always be thinking SUSTAINABILITY, right? These active Yukon Gold peelings sprouted fast and are ready to plant in the garden! The simple trick is to peel your potatoes to include an “eye” in each peel, the anatomical “action spots” where new life can generate (not hard to find eyes). Knife-peeling may work better for this than with a potato-peeler. Compost the bad-looking peelings but save the healthy ones to a flat-bottom dish. Keep the peelings fresh and damp to sprout by rinsing and draining daily, leaving a little water around them, until you have time to dig a garden trench for planting. Potato plants (Solanum tuberosum) store their life-energy in starchy nodules–potatoes– that form at the tips of modified underground stems or rhizomes. Green potato skins happen when potatoes are exposed to light–so store potatoes in a dark place. Avoid eating any green skins of potatoes as they are very bitter and may become toxic. Better to use green peelings for planting. 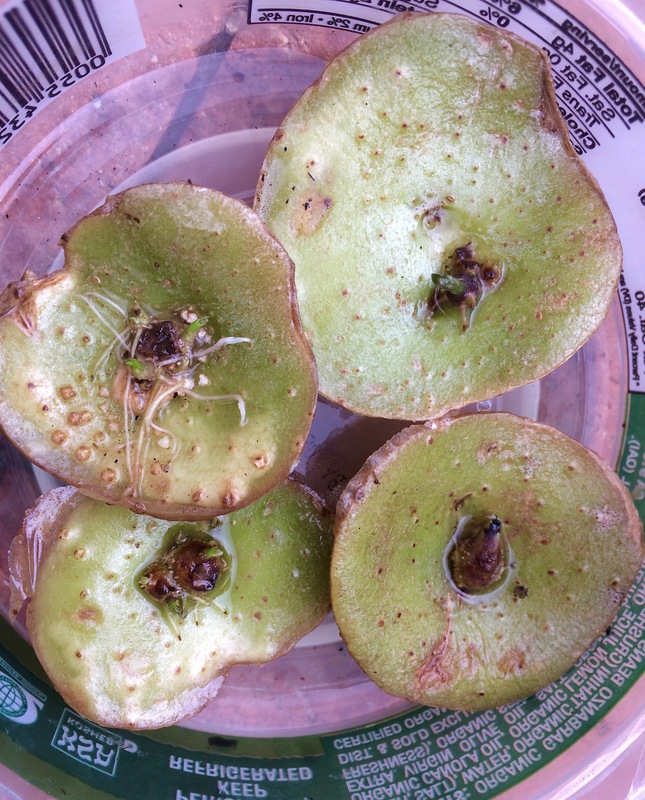 Planting my sprouted potato peels — Potato gardening in the desert is different from wetter or temperate regions where plants must be mounded up. 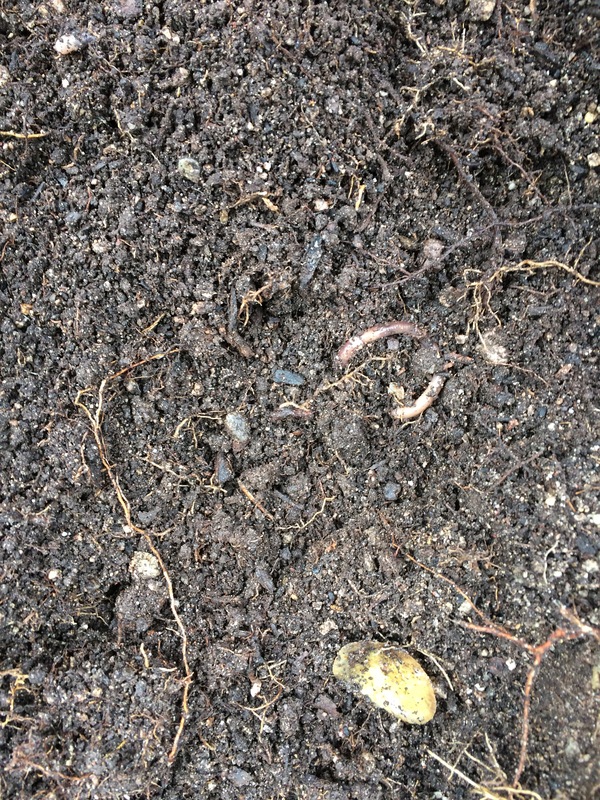 In deserts start them deep: Dig a trench in good garden soil about a spade depth and place sprouted peels at the bottom…..
As I began covering the potato peels on damp garden soil, worms came out to see what the action was. They will assist keeping the soil turned and loosened as I continue to bury the young growth this winter. Keep a pile of good garden soil at the ready. 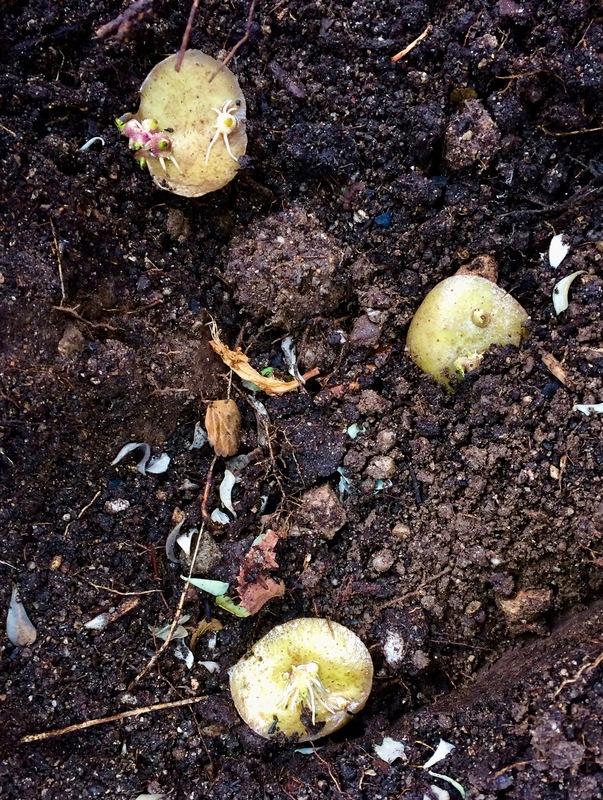 As your young plants emerge from the soil, gradually, gently, keep burying them, or top-dressing them with compost, over their days and weeks of growth to encourage the underground stems to continuously elongate, thereby adding space for more and more potatoes to form. Try never to let a little potato get exposed to the sun. As your plants grow, and as you cover them, your trench will fill, then hopefully it will even become a linear mound full of small potatoes by late spring. Don’t forget to water regularly as rains diminish. They need cold or cool weather for best growth, so get them into the ground by end of January at the latest. You could start them as soon as November’s cool weather sets in. Plan ahead to protect your potatoes from excavating ground squirrels, rock squirrels or packrats. 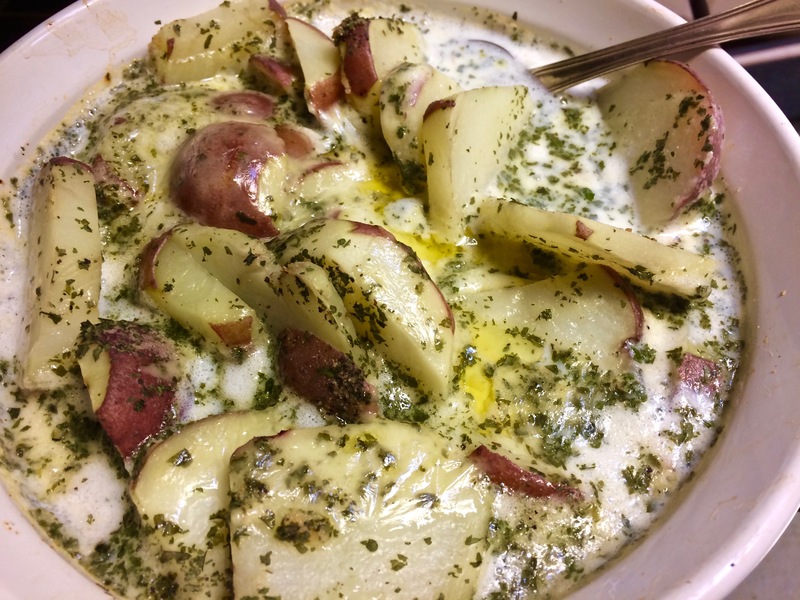 Having our “taters and eating them too”– I’m making garlic-parsley-scalloped potatoes with red potatoes I peeled for planting. Into a pyrex dish, slice 6-8 partly peeled potatoes (Skins are nutritious!). Add 1 cup of grated cheddar cheese, 1+ tsp sea salt, garlic powder and/or black pepper to taste, and milk (soy or rice milk OK) 1-2cups to barely cover potatoes. As additional seasoning options add 2 Tbsp Mano y Metate Mole mix, 1 Tbsp parsley, and/or 1 tsp paprika. Mix, Cover and Bake at 325 F for ca.45 minutes until all ingredients are happily melded. [For solar-oven cooking use dark saucepan and dark lid.]. Don’t burn your tongue when you serve them piping hot–and do enjoy the fruits of your potato-labors! 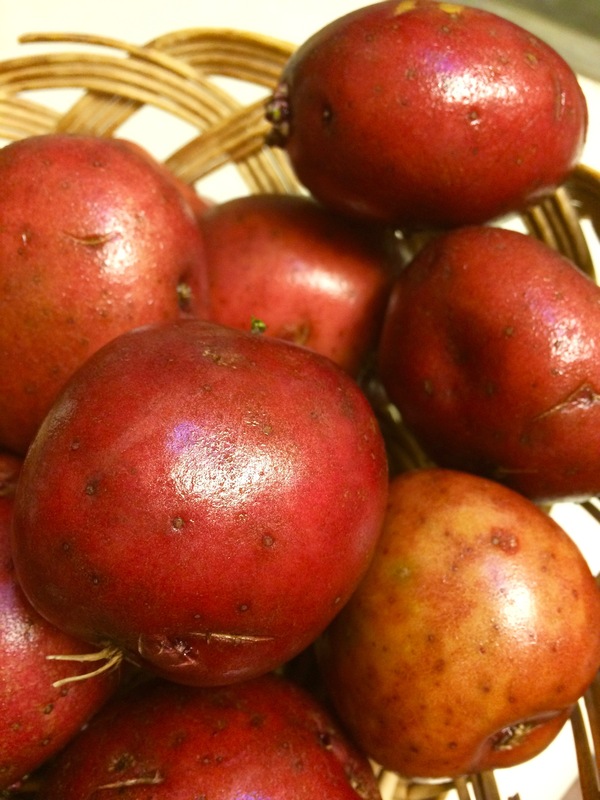 Organic new red potatoes ready to peel for sprouting AND for cooking– Now go for it–don’t waste those peelings!! Make them work for you. All it takes is a little bit of garden space and you will have new potatoes for potato salad by next summer. Happy peeling and planting! Tia Marta is an artist, ethnobotanist, and teacher about Baja Arizona’s gastronomic history and prehistory. Her heirloom foods and/or “foodie” notecards can be found at NativeSeedsSEARCH, Tohono Chul Park, the Presidio Museum, Old Town Artisans, Arizona State Museum on UA Campus, Tucson Museum of Art, the UNICEF Store, and online at www.flordemayoarts.com. 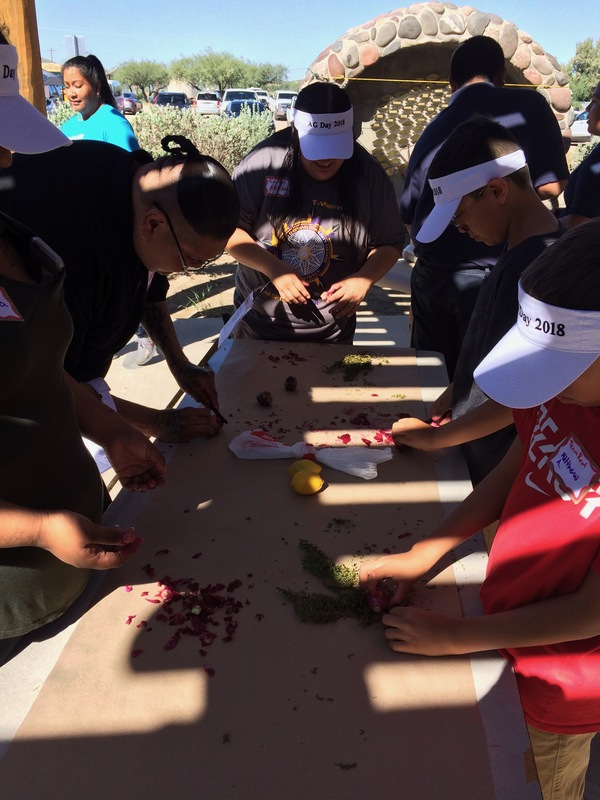 Catch one of her Native Foods workshops at Friends of Tucson’s Birthplace’s Mission Garden, or join her downtown Gastronomy Tour at Tucson Presidio. Coming up soon!–Join us to view her traditional foods artwork at the ArtTrails Open Studio Tour on Tucson’s West Side, Saturday and Sunday February 2-3, 10am-4pm both days. For directions see the centerfold in Zocalo, the Desert Leaf calendar, or go to www.ArtTrails.org. See you there! Happy Holidays and Happy National Pear Month! Jacqueline Soule here this first Friday of the month here to help you celebrate #PearMonth. Tis’ the season where there are pot lucks and holiday parties galore. 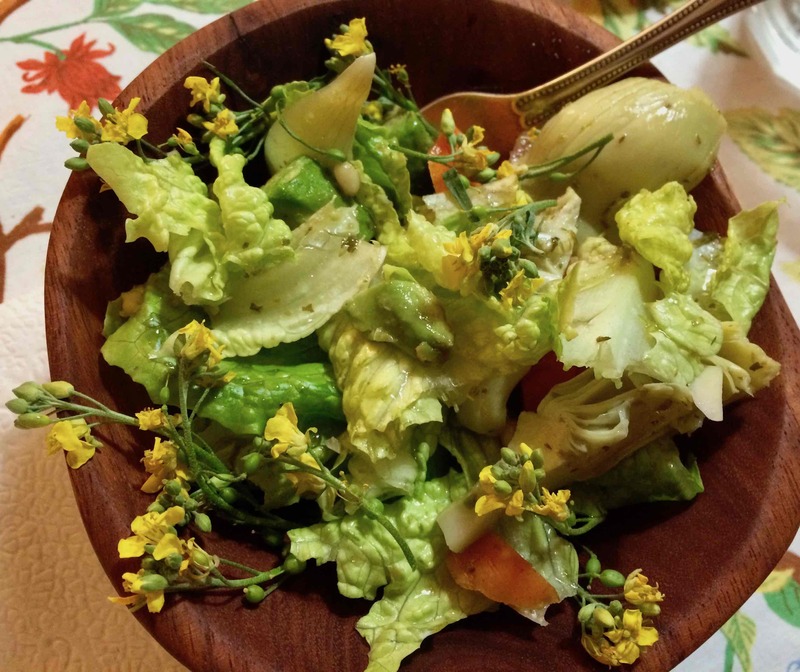 Celebrate with this light, easy, and refreshing salad to take to a party or maybe just enjoy and home in the evening after over-indulging at lunch. First of all, when it comes to traditional pear and cheese pairings – I skip the whole blue cheese (or Gorgonzola) thing. Some nice crumbly Sonoran white cheese for me – or maybe Feta if I have to. Second, the sweet juiciness of pears pairs nicely with a tangy salad green like arugula or maybe mizuna if you are growing some. Third, to my mouth, a soft fruit is complimented nicely with the crunch of a nut. I often use pecans because they are a local nut, but walnuts work well too. 2 pears – fresh or canned, slice thinly. If fresh, squeeze some lemon juice over them to keep them from browning. Combine greens, pears and nuts in a bowl. Dress the salad, Top salad with cheese crumbles. Add some pickled beets too for color and taste! Want to learn more? Like how to grow pears, arugula, and mizuna? Look for my free lectures at your local Pima County Library branch, Tubac Presidio, Tucson Festival of Books and other venues. After each event I will be signing copies of my books, including Southwest Fruit and Vegetable Gardening (Cool Springs Press, $23) – a book that includes how to grow all of these plants. Note – that link to my book will take you to Amazon and I will get a few pennies if you buy my book. You can also go to Antigone Book Store on 4th Ave. 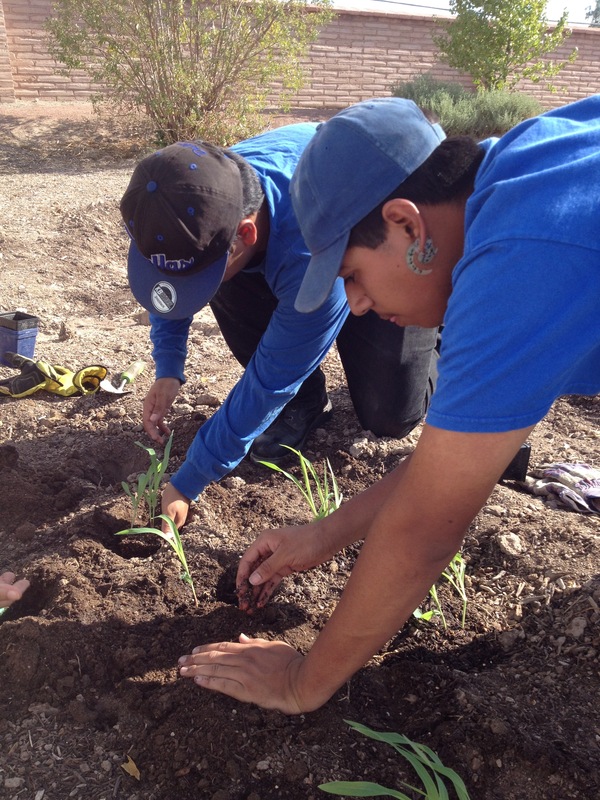 It is so exciting and deeply inspiring to see how our Baja Arizona young people are taking to gardening! From the looks of it, the future of our food will be in good hands! Tia Marta of Flor de Mayo Arts here to let you know about just a few of the interesting projects several school programs have quietly begun. 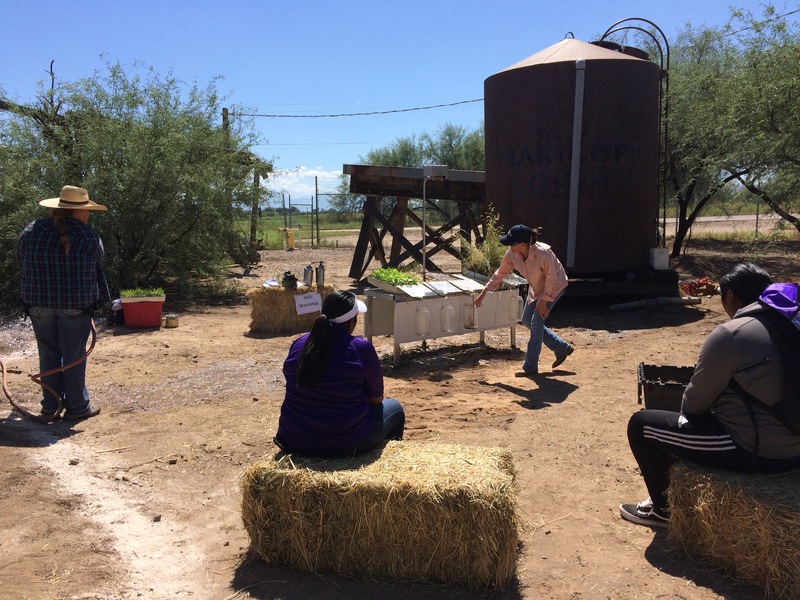 Knowledge is growing out of the desert soil, along with delicious produce. Our children are connecting with Nature, soil microorganisms, and living plants that can feed them–doing healthy activity that produces not only healthier bodies but also nutritional consciousness planted deep in the brain. Funny how dirty garden fingers can make you smarter–What a neat link! Who in the world would think a compost pile worthy of note? Well this is a record-breaker. 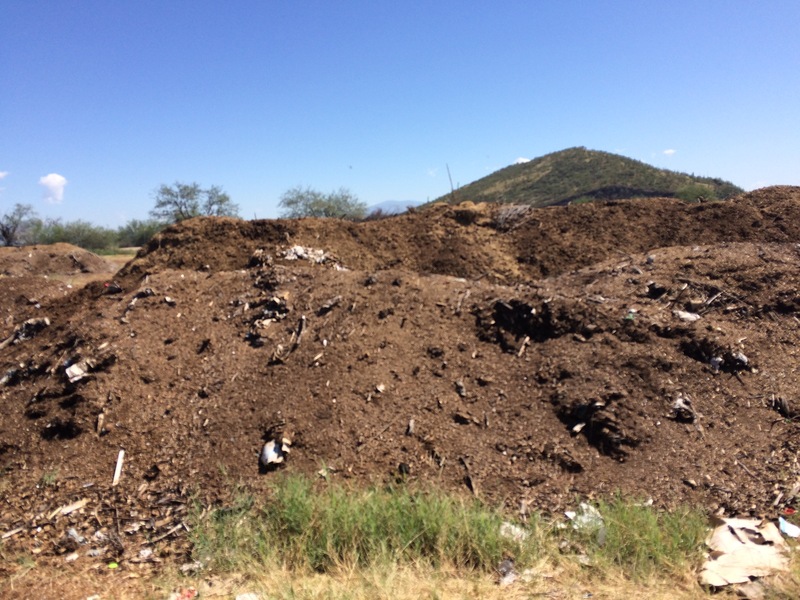 The young Compost Cats have created a gift to the future of gardening and farming in Tucson by #1 changing peoples’ habits about recycling organic waste on a big scale. (There should be a better term than “waste” –perhaps “discards”–because….) Then #2, these Cats have turned all that Tucson waste around to be a positive asset, a resource! 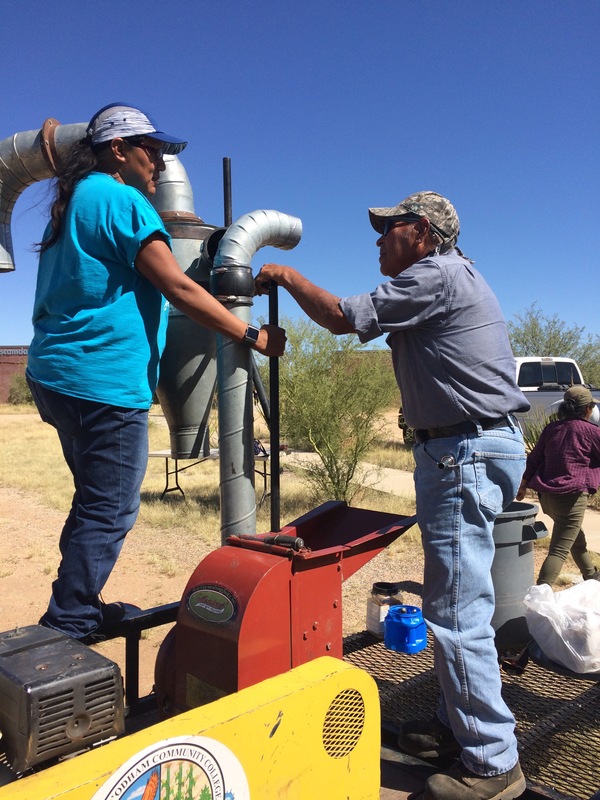 Our local southwest seed-conservation organization NativeSeedsSEARCH is providing a priceless resource to groups who can apply for their Community Seed Grants. 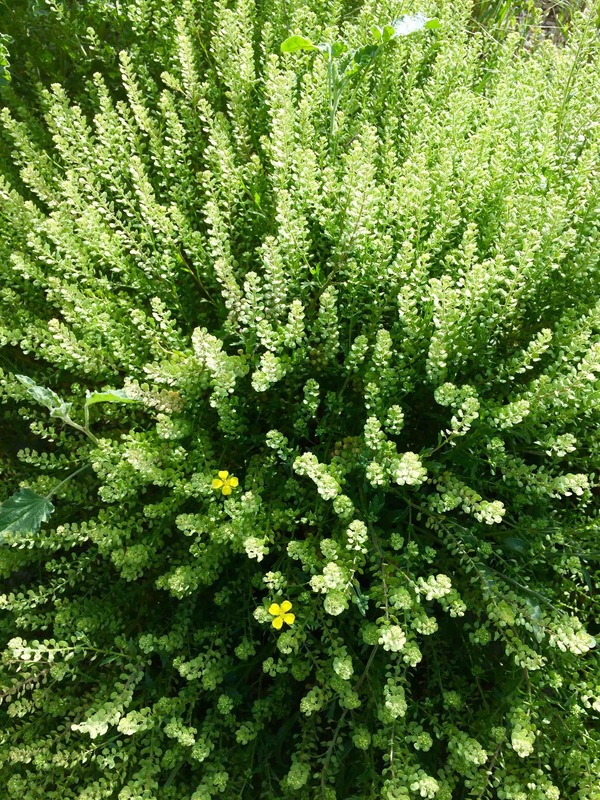 (For details check out www.nativeseeds.org). 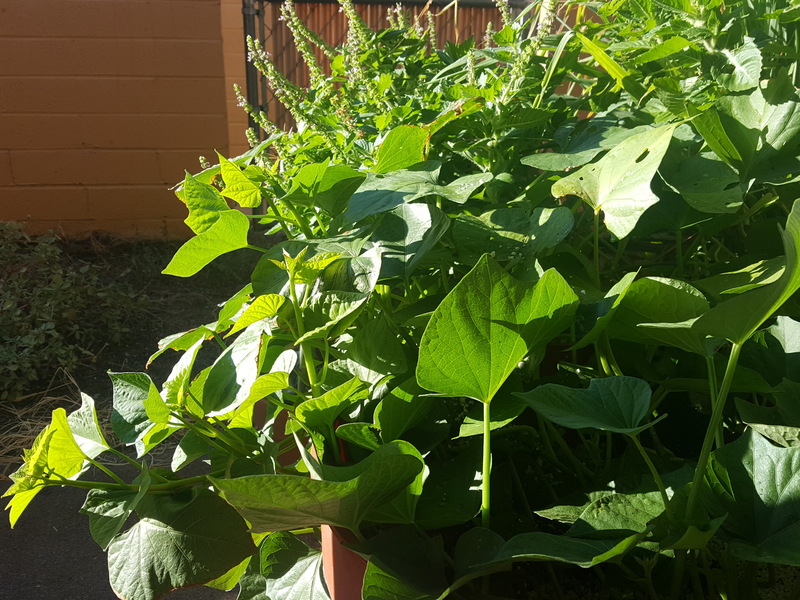 Recently a number of Tucson schools are growing amazing vegetable gardens with the seeds donated by NativeSeedsSEARCH, including Ochoa Elementary, Nosotros Academy, Tully Elementary, Roskruge Bilingual K-8 Magnet School, and Pima Community College. You can read about Seed Grant Superstars in the latest issue of Seedhead News available by calling 520-622-0380. Become a member and support this program for the future! 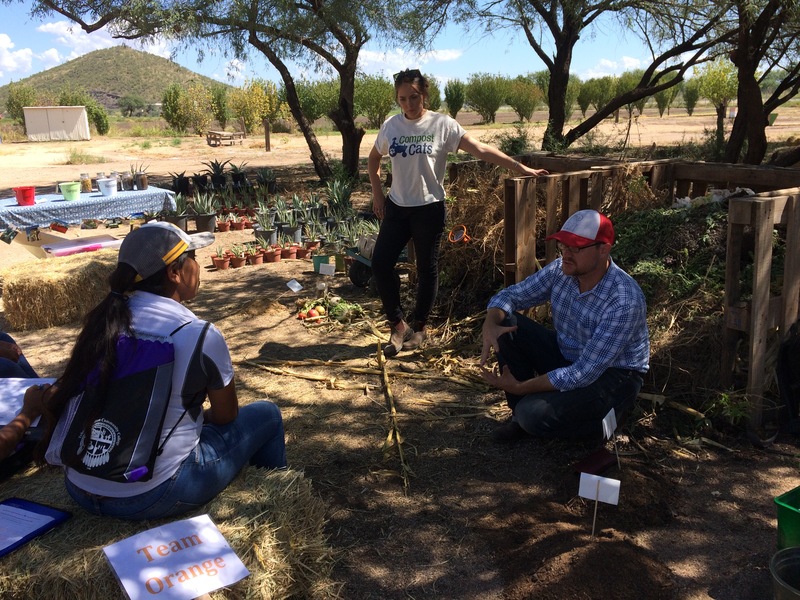 Teachers, like Tohono O’odham Community College Professor Clifford Pablo in the Agriculture Program and through Cooperative Extension, have inspired a couple of generations of youth to learn modern ag methods along with a deep respect for traditional foods and foodways. His interns have become teachers themselves, and their agricultural products–grown as crops and wild-harvested–are being used for celebration feasts, special ceremonies, and sometimes even appear in the TOCC cafeteria. Let’s rejoice in the good work that these young people, in many schools and gardening programs throughout Baja Arizona, are doing! In the words of Wendell Berry, one of the great voices of our time about the very sources of our food, “Slow Knowledge” is what we gain from gardening and farming. For our youth, the connection of healthy soil, healthy work outside, the miracle of seeds sprouting into plants that eventually feed us–this slow knowledge cannot be learned any other way. We now know that such “slow knowledge” gained from assisting Nature to grow our food actually grows healthy neurological pathways in young brains and makes them think more clearly, be less stressed, achieve better understanding in math and language, and develop better critical-thinking skills. What better prep for being leaders than to play in the garden as a youth!! Link to the latest UA Alumni Magazine (fall 2018) for a heartwarming article by our Blog-Sister Carolyn Niethammer about the University of Arizona’s partnerships with local school gardening programs. Watch the Mission Garden’s website www.tucsonsbirthplace.org for many gardening activities, celebrations, and workshops coming up that are perfect for kids and elders alike. You can contact me, Tia Marta, on my website www.flordemayoarts to learn of desert foods workshops where interested young people are welcome. Young people know that food security will be in their hands. Indigenous youth and some disadvantaged communities seem to realize that “the government” will probably not be there as a fall-back food provider. 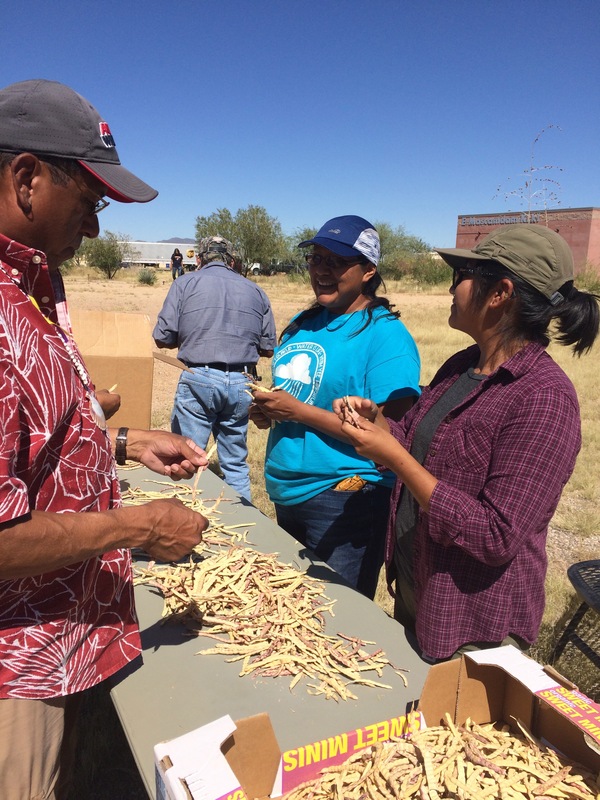 Youth all across Arizona are learning the skills of growing food sustainably and may even begin re-teaching the elders–in time. 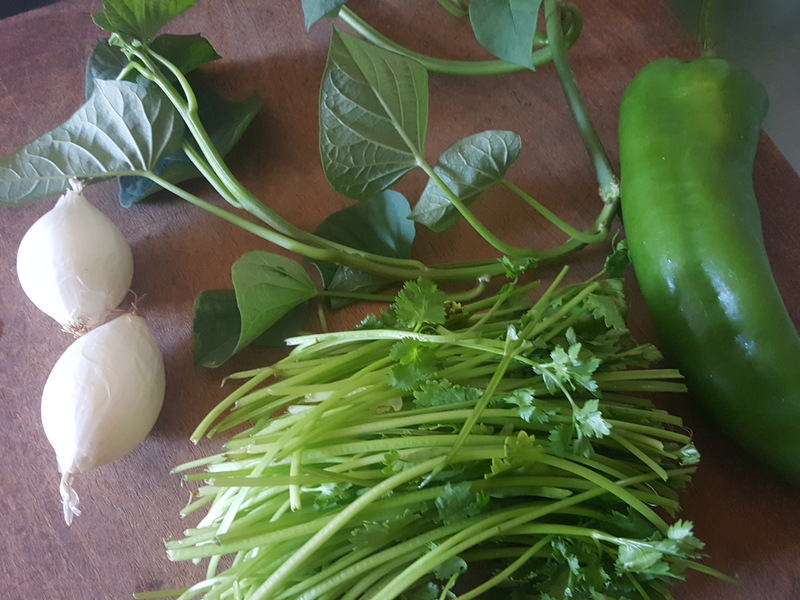 To make the dish, I started with cilantro stems that would otherwise go to waste, onion, green chile, and the sweet potato leaves plucked from the vines. I roasted the chile and let it cool as it sweated it in a covered container. 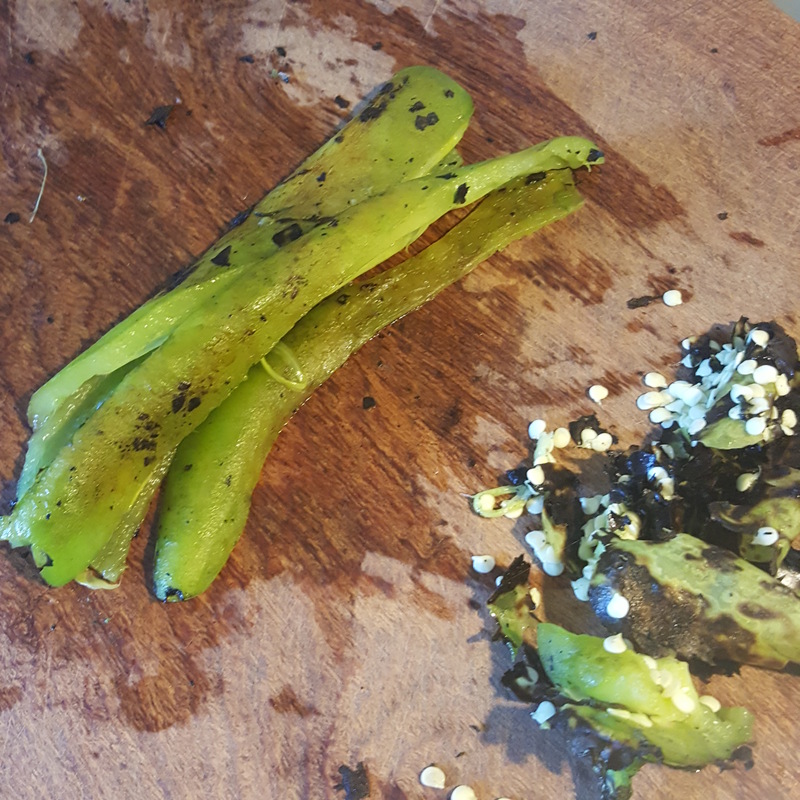 Then I peeled, seeded and chopped it. 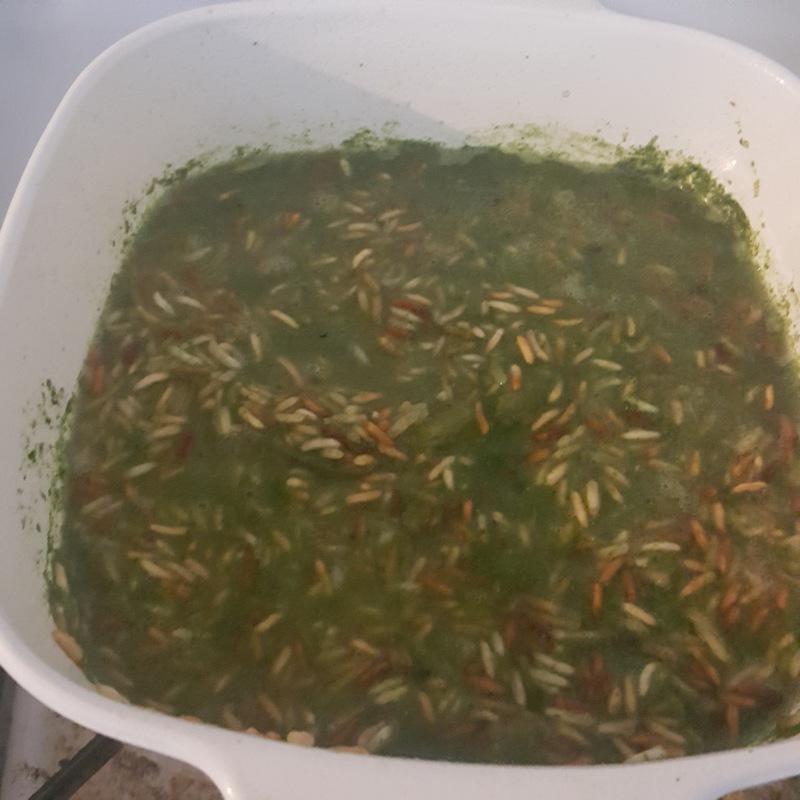 Then cilantro stems, onion and a handful of sweet potato leaves went in the blender with the amount of water needed to cook a cup of rice (The volume of water varies by variety of rice.) 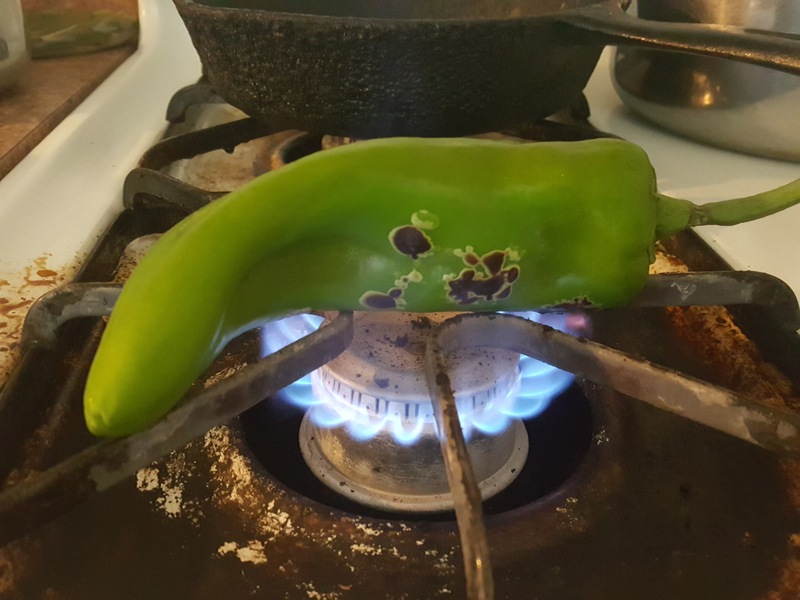 The chile can go in the blender, but opted to leave it coarse. 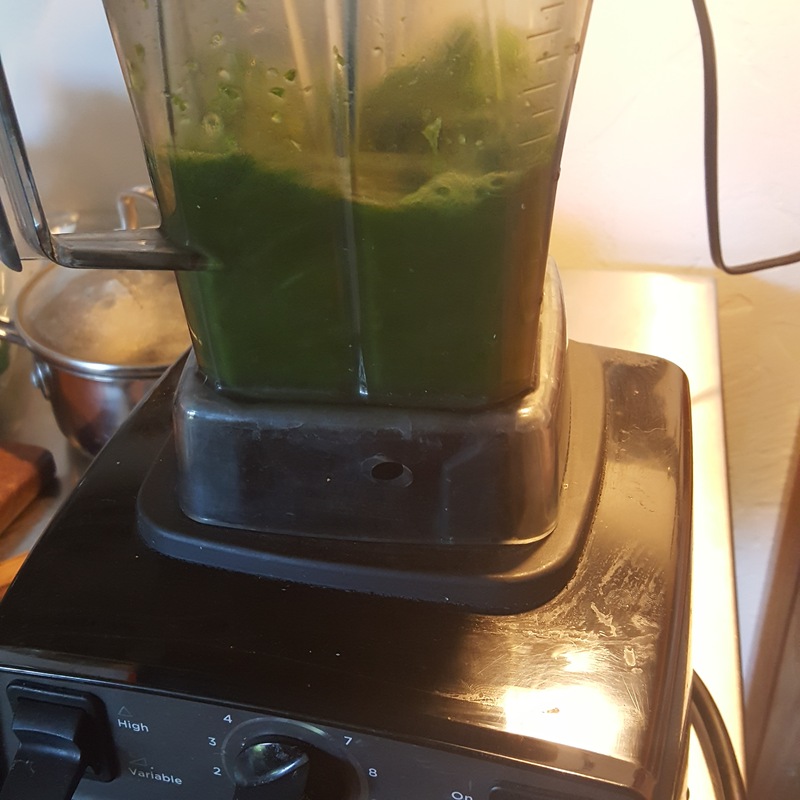 Actually, it could all be coarsely chopped instead of blended. 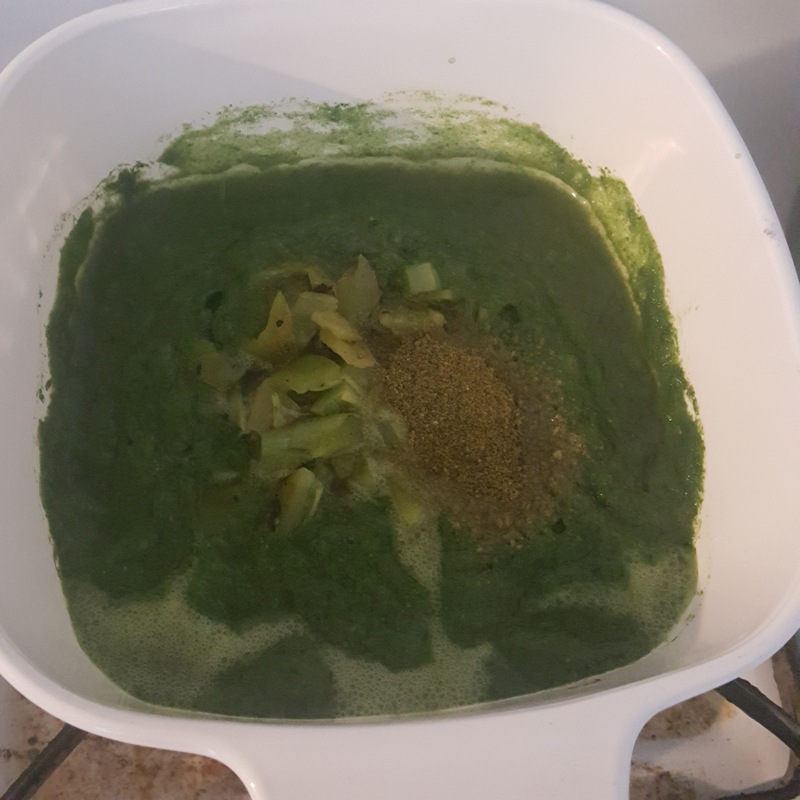 The green slurry went into a dish to simmer with the chile, salt and some Mano Y Metate Mole Verde powder. 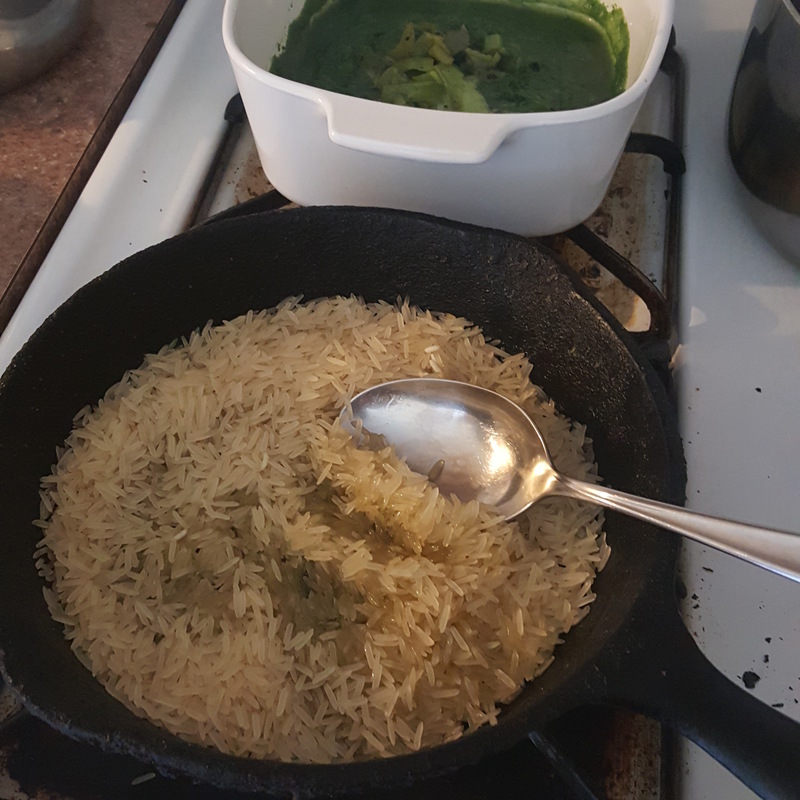 While that heated, I browned the rice in olive oil. For me, the trick is to keep from stirring it too often, so it gets some nice dark spots. 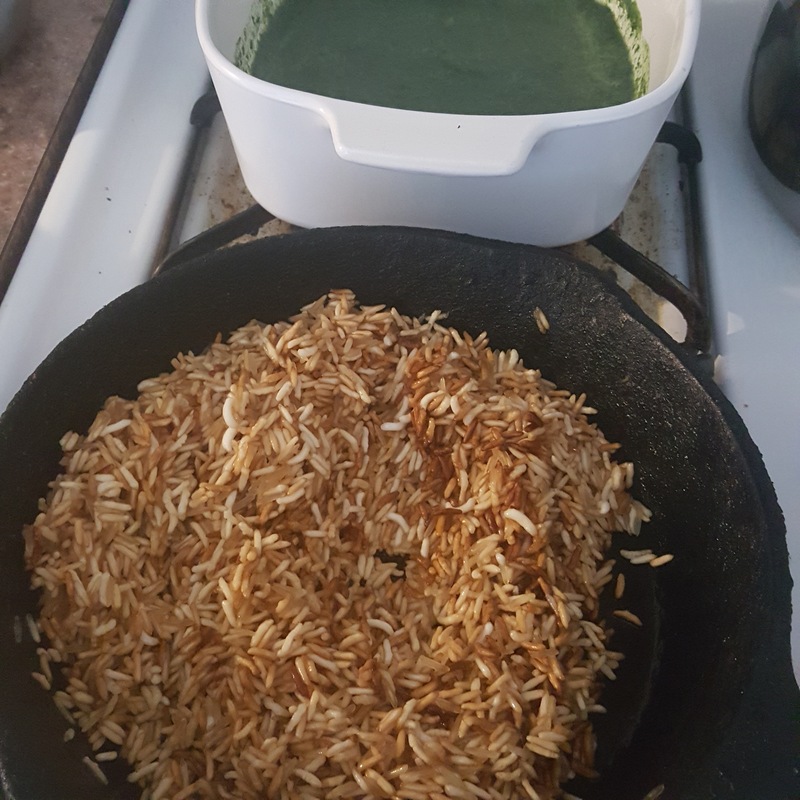 I spooned the browned rice into the green liquid, covered and simmered on very low heat. 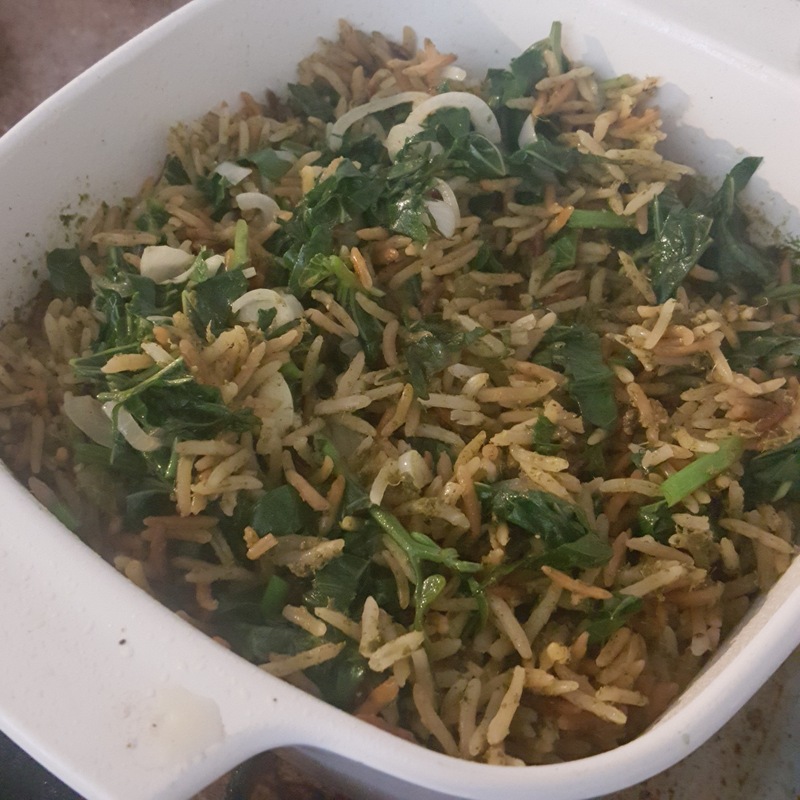 Once the rice was tender and the liquid absorbed, I added some chopped sweet potato greens sauted with onion and garlic and folded all together. Attention: native-plant-lovers, desert gardeners, Southwest culture buffs, curanderas, survivalists, artists and the just plain curious! 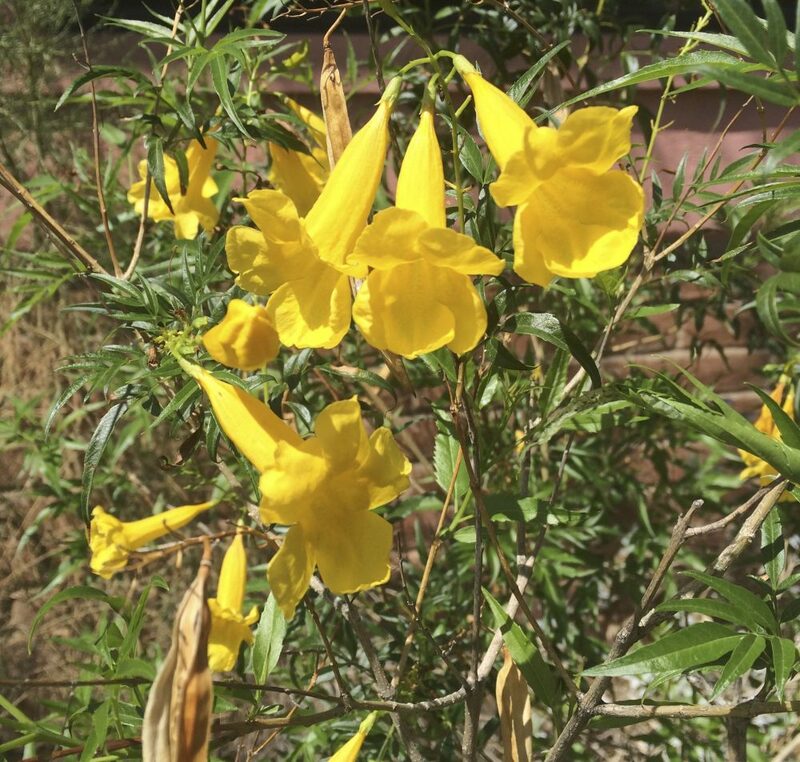 Set your iPhone Calendar ready to mark right now for a long-awaited event: the Grand Opening of the Michael Moore Memorial Medicinal Plant Garden, this coming Saturday, September 22, 2018, 8am-10am at Tucson’s Mission Garden. 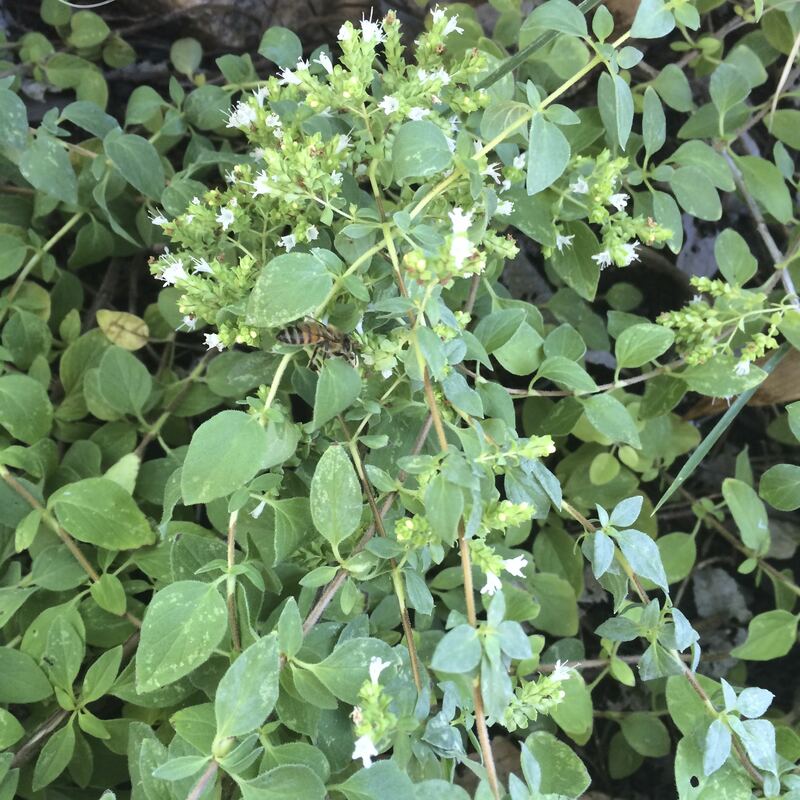 Tia Marta here to give you a little “taste” of how you can incorporate what you learn about our native medicinal plants into your own landscaping–to add not only sensational seasonal beauty around you, but also to put their gifts of traditional medicine right at hand, in your own yard! available at upcoming events in Tucson. 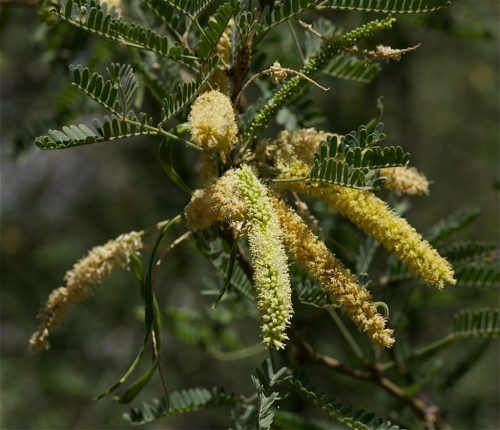 Plus another new one– Eat Mesquite and More— by Brad Lancaster’s DesertHarvesters.org, will be celebrated at the UA Desert Lab on Sept.19. 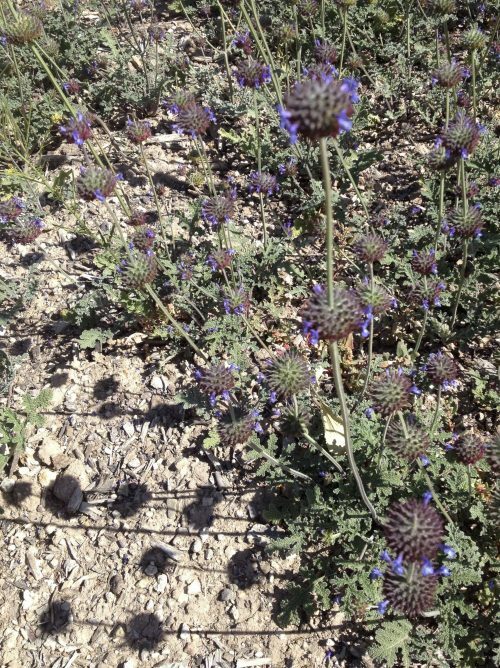 Mission Garden will also feature Nabhan’s latest Sept 29 sponsored by BorderlandsRestoration. 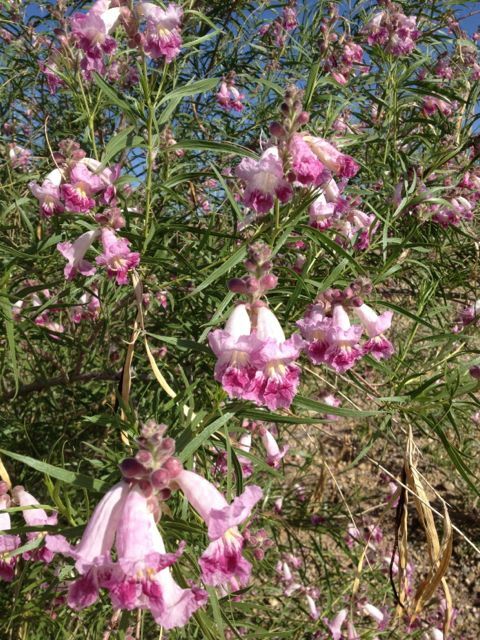 You may find many of these showy medicinals like Verbena gooddinggii, desert willow, Tecoma stans, native velvet mesquite, honey-mesquite and screwbean, or elderberry at upcoming fall plant sales at Arizona-Sonora Desert Museum Sept 29-30, Tohono Chul Park Oct.13-14, and at Desert Survivors Sept.25-29, 2018. 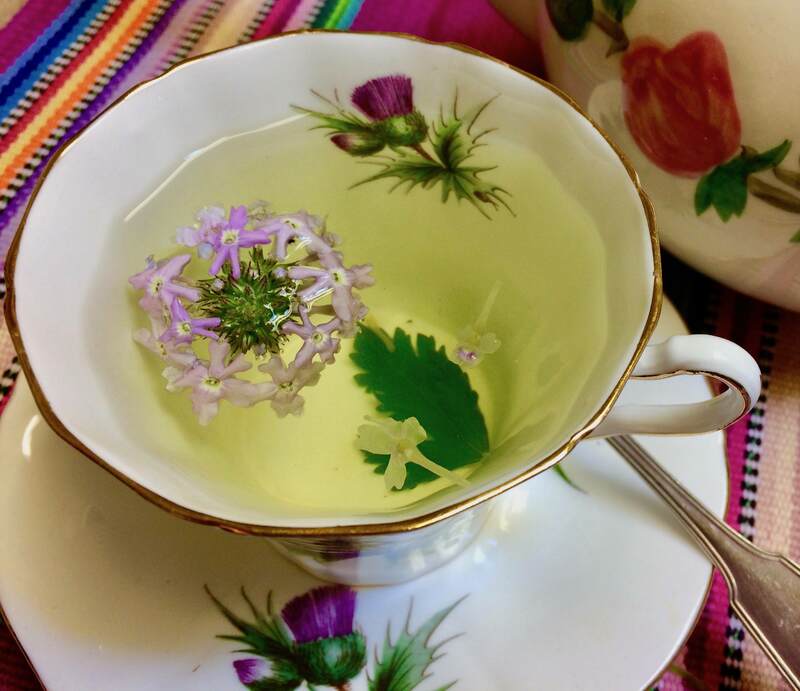 I hope these photos have been an inspiration for you to delve deeper and to plant a medicinal! Members of Tucson Herbalist Collective (better known as THC), including Tia Marta here, will be on hand at the Michael Moore Memorial Herbal Medicine Garden Opening, Tucson’s Mission Garden Sept 22, to introduce you to many gifts of our desert medicinals, share samples of herbal teas, tastes, and answer questions. Please pass the word about these neat events by sharing this blog with potential followers. See you there! In a few short days it will be September – which is “National Honey Month.” Even if you never eat honey, you still enjoy how hard honey bees work. Bees pollinate an amazing number of crops that we use, including food, fodder, fiber, and oil crops. USDA reports that roughly one third of our daily diet relies on honey bees. Honey bees are not native to North America. They were brought over from Europe early in the colonization phase, promptly escaped, and spread across the New World at a rapid clip. There is no way of knowing if they caused the extinction of native bee species, but indications are that there was more than enough nectar and pollen for all species, native and introduced. When bees make honey, they take the nectar that the plants create through photosynthesis and remove most of the water (creating a super saturated solution). Since the plants link carbon dioxide and water together to form glucose and fructose, that’s mostly what honey is. There are also traces of amino acids, vitamins, and specific phytochemicals that plants put into their nectar to reward pollinators. Honey and human metabolism. Yes, glucose and fructose are sugars, and blending them into honey doesn’t change that. The glycemic index of honey is lower than refined white table sugar but glycemic response to honey is highly individualistic. The American Diabetes Association has a cautiously worded stance that honey might be preferred over sucrose. In general, honey has clear advantages over table sugar when it comes to traces of amino acids, essential proteins and immune boosting capabilities. Honey and teeth. Honey contains only small amounts of sucrose, the sugar that causes plaque to adhere to teeth. Honey also contains phytochemicals which appear to have some antimicrobial action against oral pathogens. Thus honey is a better sweetener than table sugar, at least as far as the daily health of your teeth are concerned. The wound healing and antimicrobial properties of honey may be valuable in the treatment of periodontal problems, and in treating tissues after oral surgery, two topics currently being investigated. Honey and energy. Honey is a concentrated source of fructose, glucose, and other di-, tri-, and oligosaccharides, as well as amino acids human bodies need for energy. Studies show that honey is an economical alternative to carbohydrate gels for athletes. Honey and food. There are numerous ways to savor honey in cooking and meal preparation, not to mention creating alcoholic beverages. A simple salad dressing of honey, apple cider vinegar, and olive oil is delightful, and quick to make. Want to learn more? Look for my free lectures at your local Pima County Library branch, Tubac Presidio, Tucson Festival of Books and other venues. After each event I will sell and sign copies of my books, including Southwest Fruit and Vegetable Gardening (Cool Springs Press, $23). Article copyright by Jacqueline A. Soule. All rights reserved. Republishing an entire blog post or article is prohibited without permission. I receive many requests to reprint my work. My policy is that you may use a short excerpt but you must give proper credit to the author, and must include a link back to the original post on our site. Photos copyright Jacqueline A. Soule where marked and they may not be used. On a recent trip to Spain we enjoyed an adventurous meal in a Basque tavern where we were introduced to Pintxos–the special Basque version of tapas–northwest Iberian finger-food. These culinary mini-sculptures bring together the most unexpected combination of foods and flavors. Each one is a creative work of edible art, visually and deliciously pleasing, handy for a pick-me-up meal or a many-course dinner. Here’s a perfect summer pintxo—a little Sea of Cortes Seafood “Boat.” First find some ripe tomatoes from your garden or your favorite farmers’ market. Next source some fresh, sustainably-harvested crab meat or tuna and Sea of Cortes shrimp. Pintxo actually means “toothpick” or “skewer,” so have a supply of long toothpicks or bamboo skewers ready. You will also need: 1) fresh tomato, cut in half so that each half can rest as a “boat” without tipping. 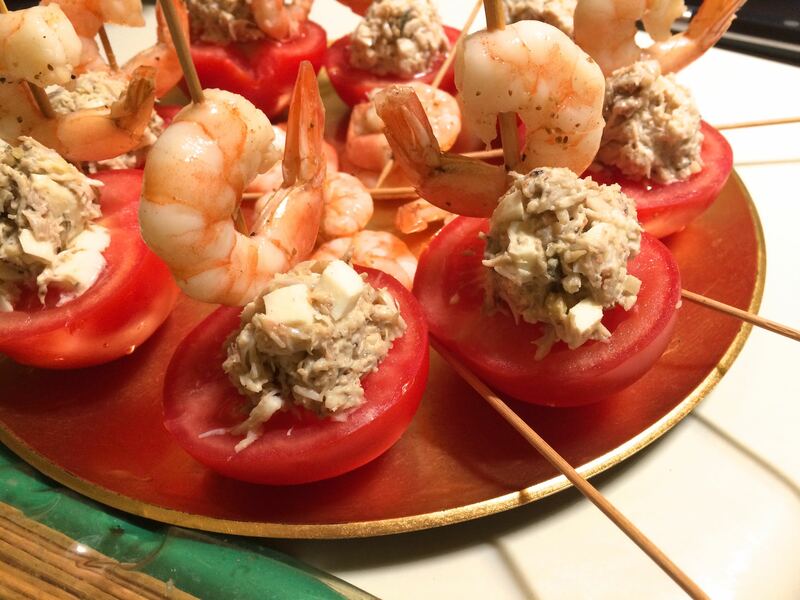 2) crab or tuna salad, made with boiled egg chopped, fresh chopped oregano leaf and a tad of mayonaise to taste; formed into a ball, 3) cooked, chilled shrimp. Skewer a shrimp vertically from the top and then down thru the tomato (see photo) so that the shrimp becomes the “spinnaker sail” in your little sculpture. 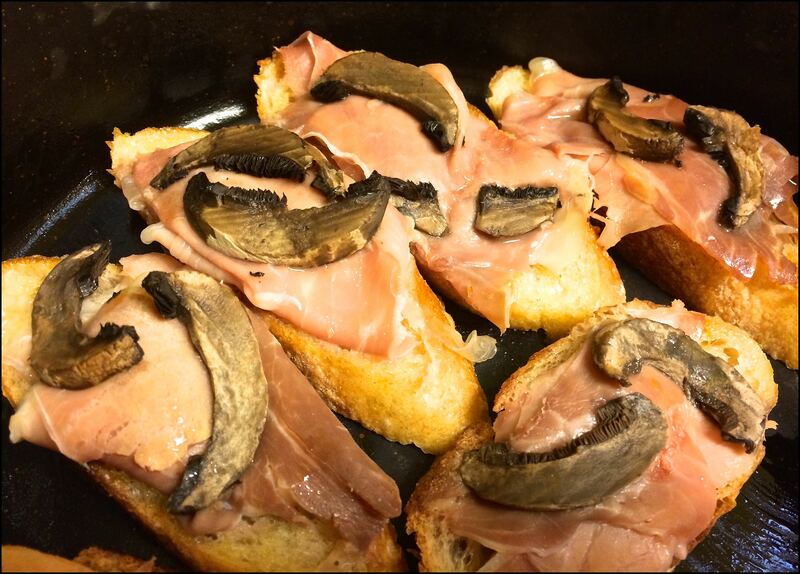 Other neat pintxos can be made as layered, open-faced miniature sandwiches. 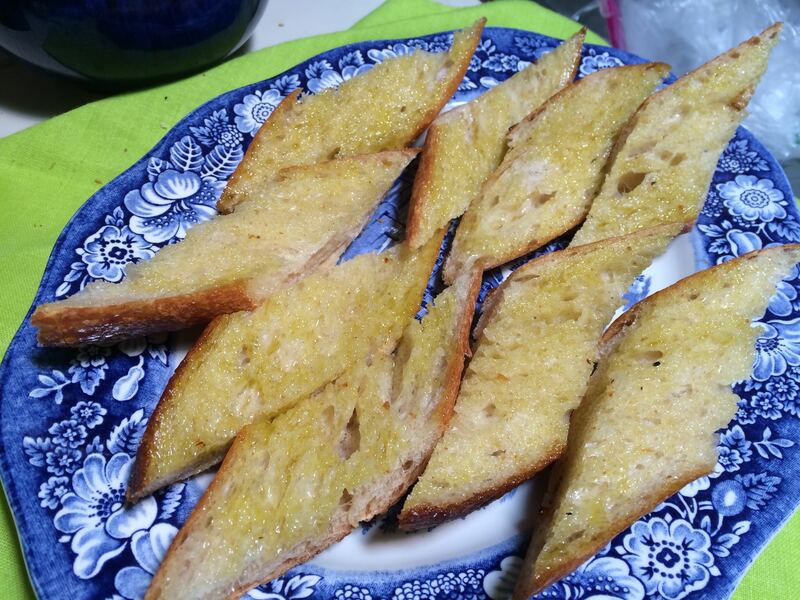 I went to Don Guerra of Barrio Bread to find our best local equivalent of the bread the Basque are using in Spain for making pintxos. 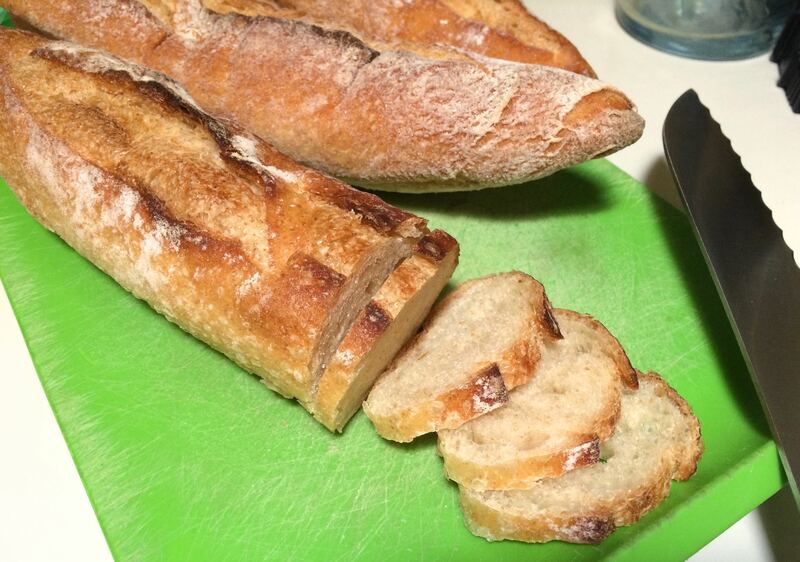 Having been in Spain himself, he knew immediately and suggested his baguettes made with BKWFarms‘ heirloom organic Padre Kino White Sonora Wheat flour as our perfect pintxo bread. Indeed it is! 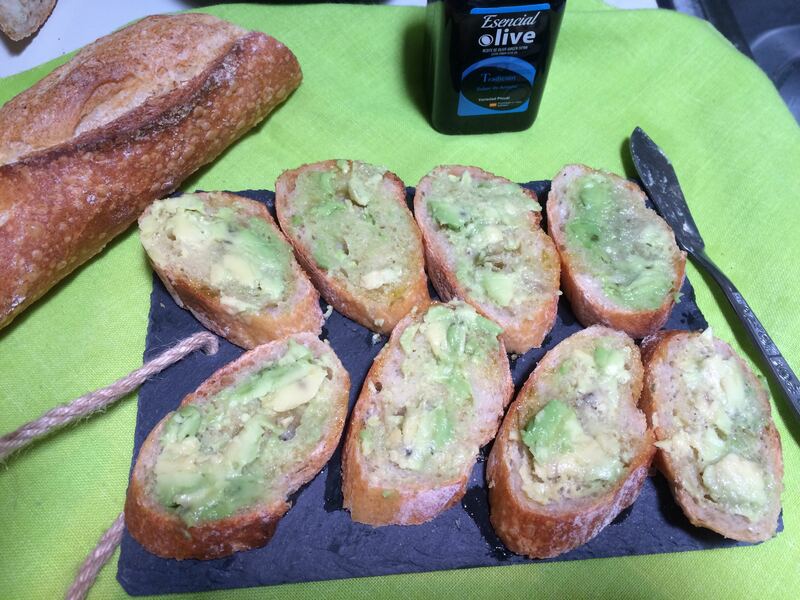 Barrio baguettes lend themselves to cutting in several different shapes, a distinct shape for each different pintxo style. 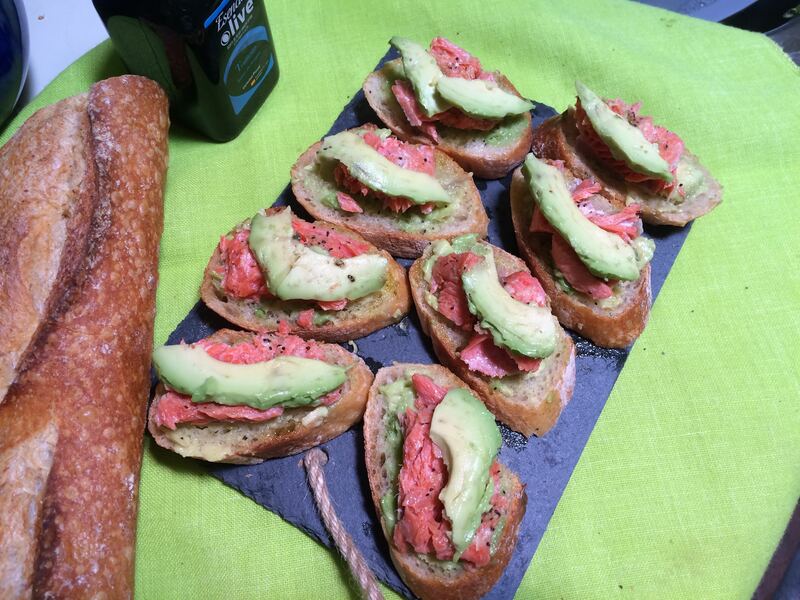 For the next pintxo–the Four-layer “Salmon in the Tropics” Pintxo–I cut the baguette at an angle to make elongate ovals as the pintxo base. 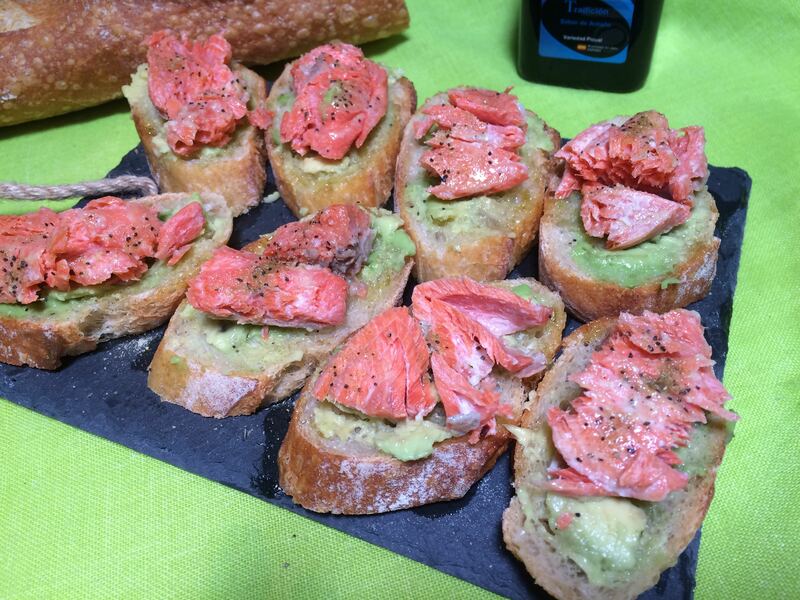 So there you have the Four-layer Salmon in the Tropics Pintxo–a taste combo that I personally would never have thought of, were it not for the creative Basques. 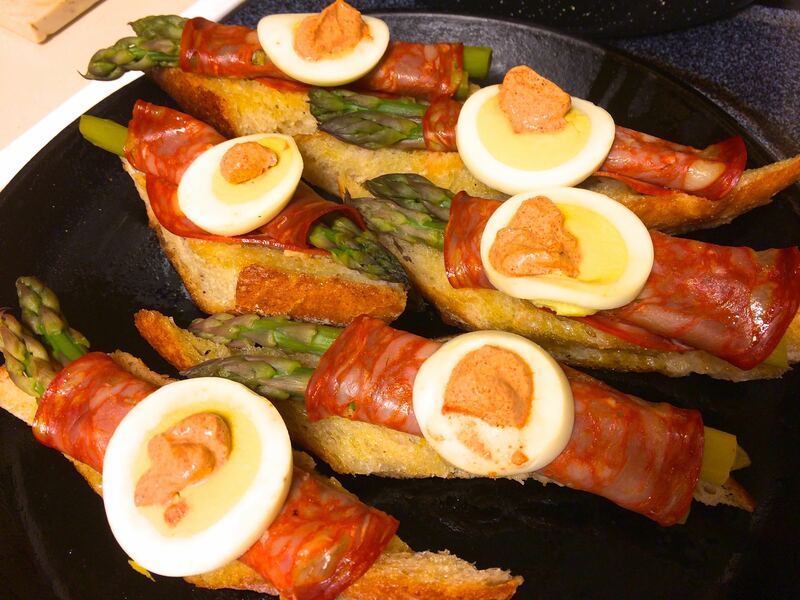 If you aren’t hooked or at least amazed yet, here’s another fun pintxo idea, this time using our local asparagus and chorizo! Have you ever heard of such an unexpected combination of flavors? Well it really works! Wrap asparagus spears in chorizo. If you have Mexican-style chorizo, fry the chorizo-wrapped spears until chorizo is barely done then place on bread to bake in oven or solar oven. If sliced Spanish-style chorizo is used, bake entire bread/asparagus/chorizo stack in oven or solar oven. Bake pintxos until asparagus is al-dente (not too long, 300degrees 12-15minutes, or roughly 20-25minutes in a preheated solar oven). Top with sliced boiled egg and Chile-yogurt sauce. These pintxos are only the tip of the iceberg of ideas you can create with silvers of your favorite veggies, fruits, fish, or sliced cheeses and meats! 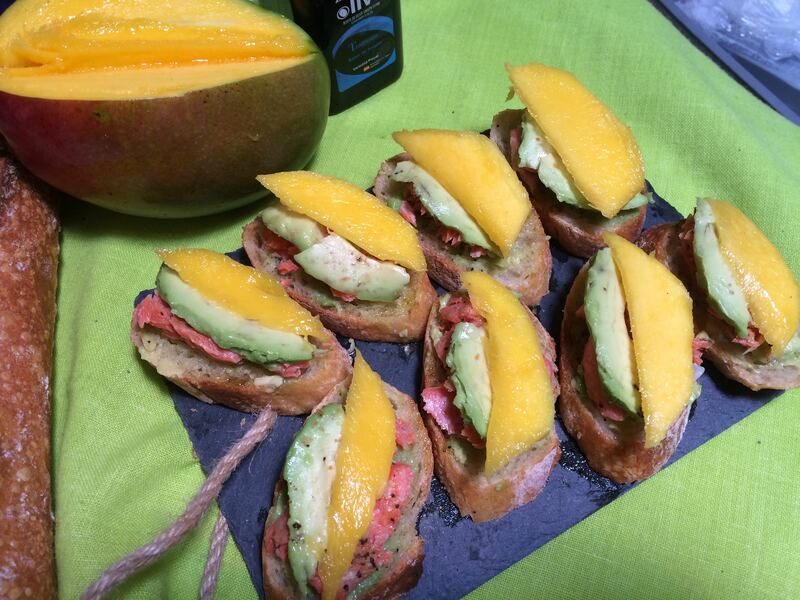 Try thin slices of Mexican queso asadero melted into your pintxo or Spanish manchego cheese. Or try a combo of thinly sliced sweet cajeta de membrillo (Sonoran style quince conserve*) and asadero cheese baked gently on a Barrio Bread baguette oval! 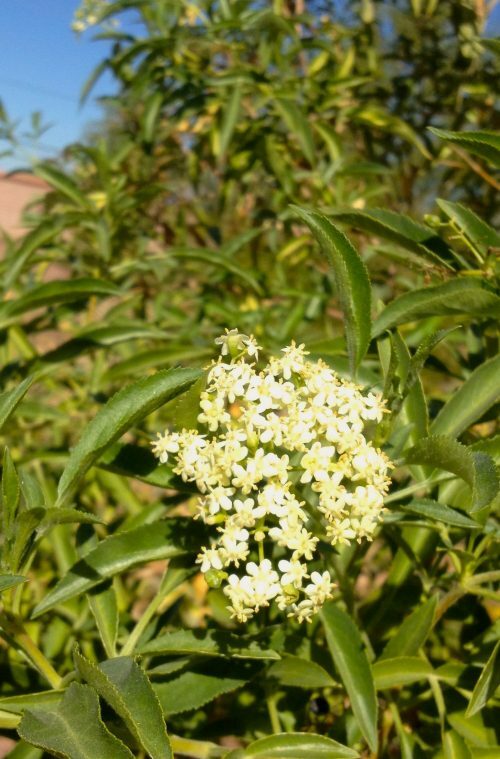 *Tucson’s Mission Garden is the place to learn about membrillo fruit and the delicious traditional Hispanic recipes for it. During the fall harvest you can sign up for workshops to learn how to make your own cajeta de membrillo. For easy pinxto baking, reaping the gifts of our intense sun, you can order a sleek, easy-to-use solar oven from Flor de Mayo. Check out www.flordemayoarts.com for a how-to video. Tia Marta here encouraging you to enjoy new combinations of our local Baja Arizona provender in your own pintxo creations!